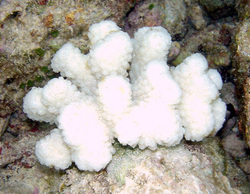 Coral bleaching is not strictly a disease but is in impairment in the overall health of the coral. 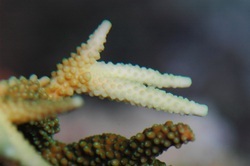 Bleaching results from the loss of the corals intracellular endosymbionts (Symbiodinium, also known as zooxanthellae) through either expulsion or loss of algal pigmentation. Bleaching usually results in response to a stress event. Most commonly in the news and in literature, bleaching is triggered by increases in temperatures, above the corals normal threshold (~32C). 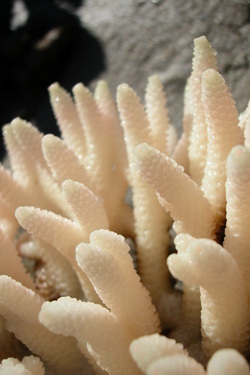 However in aquarium, most corals can withstand temperatures higher than this. This may be due to the corals having undergone a strong selection pressure for more tolerant species. The long process from collection to arrival in your house, means sensitive species or colonies will often not make it. 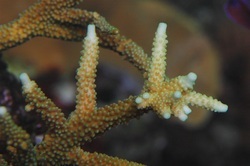 Furthermore, many popular corals in aquarium such as the Acropora sp. likely stem from a few stock colonies again those which have survived and grown well. One further hypothesis, why aquarium corals are often more tolerant to stresses may be they were collected from areas known as 'hot spots' in the Indo-Pacific. these are countries such as Thailand and Indonesia, where the corals are used to higher temperatures than their normal condition in other areas of their range. Keeping tank conditions at an optimum will keep this syndrome from affecting your corals. Remember, that even if your corals do bleach, they are not dead, they have just lost their algae and reacquire these when conditions return to normal. However, when the coral is bleached it is in a stressed state with lower immunity to specific pathogens and many of the diseases talked about on this site can follow soon after a bleaching event.